JJim creates new multi-family development opportunities for Flaherty & Collins Properties. Jim is involved throughout the entire development process to ensure the property is developed for maximum investment return. During his nearly 19 years at Flaherty & Collins Properties, he has participated in the development of more than 3,500 units. Jim is married with two children. He enjoys playing sports and spending time with his family. Jim’s professional career began in 1985 in commercial banking with The Indiana National Bank. 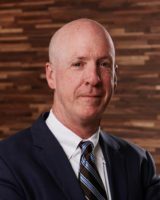 In 1988, he began a 10-year stint in commercial real estate with two local firms, specializing in office leasing, development and acquisition. He joined Flaherty & Collins Properties in 1999.